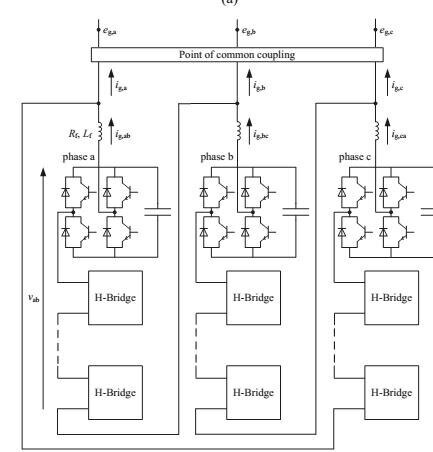 POWER ELECTRONICS ABSTRACT 2016-2017 INVESTIGATION OF NEGATIVE-SEQUENCE INJECTION CAPABILITY OF CASCADED H-BRIDGE CONVERTERS IN STAR AND DELTA CONFIGURATION ABSTRACT: The aim of this paper is to investigate the ability ofcascaded H-bridge STATCOMs in star and delta configurationto exchange negative-sequence current with the connecting grid.Zero-sequence voltage for the star and zero-sequence current forthe delta configuration are utilized to guarantee DC-capacitorvoltage balancing. A general solution for the required zerosequence voltage/current for any kind of unbalanced conditionis provided. The obtained solutions show that a singularity forboth configurations exists under specific conditions, leading toinfinite zero-sequence requirement. In case of star configuration, this singularity occurs when the amplitude of the positiveand negative-sequence components of the current output of theconverter are equal. Analogously, the singularity for the deltaconfiguration occurs when the amplitude of the positive- andnegative-sequence components of the voltage at the converterterminals are equal. This singularity impacts the ratings of thesystem and imposes a limitation in the utilization of the compensator for unbalance compensation purposes, both in industrialand utility applications. Experimental results are presented tovalidate the theoretical analysis.